It’s that time of year again; it’s our anniversary! We’ve been open for four years and we’re so thankful to our wonderful customers who have helped make this possible. To celebrate we’re taking 50% off selected retail items for the month of April. All other retail items are on sale with savings of 10% off including Taste of the Wild dog food. So come see us and help us celebrate! Did you know that second hand smoke is just as dangerous to our pets as it is for us? Cats who live in homes with smokers are more than twice as likely to contract lymphoma. Cigarette smoke is also connected to an increased occurrence of canine nasal cancer, especially in longer-nosed breeds like German Shepherds, Collies, and Greyhounds. Finally, something I recently learned, cigarette smoke is linked to atopic dermatitis in dogs, which is an allergic skin disease which is a common cause of scratching, itching, and skin infections. There is so much research and information about how cigarette smoke affects our pets these days. If you’re curious or have questions about the affects of cigarette smoke on our pets, my suggestion is to Google it. You may be surprised at what you learn. I was. For April we have two pets of the month. 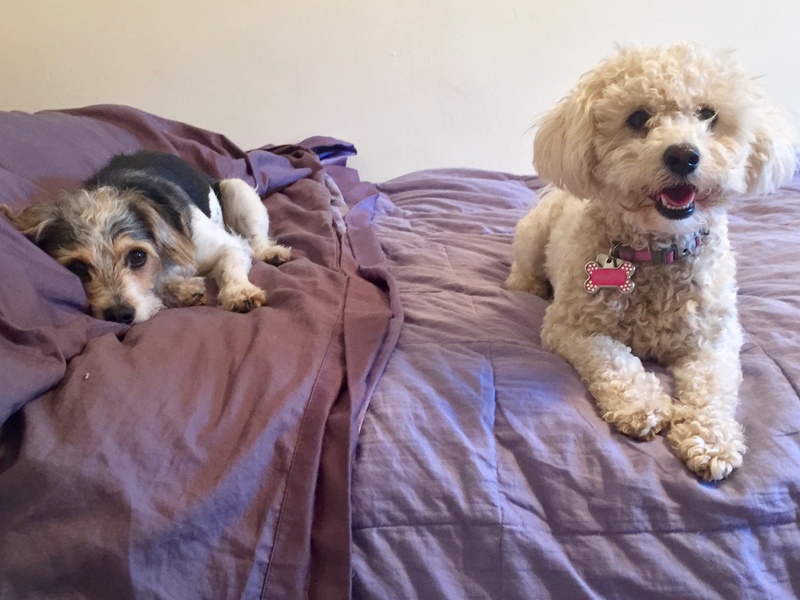 Sweetie is a Maltipoo and Milli is a Jack Russell mix. Sweetie and Milli come to us for grooming. They’re awesome dogs and we always enjoy seeing them. When obedience training your dog there are two words that you should make your mantra. The first is patience. You must be patient. The second word is repetition. You should expect to do 100 repetitions of what your dog is learning before he/she really knows the skill you’re teaching. Repetition. The more you do it, the better your dog will learn it. So, once more, repetition.